The key in looking fresh all day is of course not with just makeup. To look good we also need to feel good. What can be the answer to achieve moisturized skin and makeup that stays the whole day? *Drum roll* ~ Facial Mist!!! All the good stuff in a sweet-smelling bottle that refreshes and clarifies, Beauty Bakery’s Clarifying Witch Hazel Facial Mist is specially made to keep you feeling crisp and clean all day. Each delicious bottle contains an unbeatable blend of Witch Hazel Water and Tea Tree Extract to fight off inflammation and bad bacteria, and is infused with a bright, clean citrus scent to keep you smelling fresh no matter the occasion. Ingredients: Water, Witch Hazel extract, Tea Tree extract, Lemon extract. Instructions: Mist onto face within an arm’s length to freshen up your skin. Product can be refrigerated to heighten cooling sensation. I love witch hazel for my pores, ever since I have tried Dickinson's toner. Tea tree extract on the other hand is the perfect buddy in getting rid of acne. Lastly, lemon extract, can whiten and brighten the skin. The mist is inside a glass bottle with spray type pump. Its simply labeled with the Beauty Bakery sticker. The pump is working perfectly, but its kinda heavy and I cannot bring it with me when I go out so I bought a mini plastic bottle with spray pump as well so I can have a travel friendly version of it. Beauty Bakery Clarifying Witch Hazel Facial Mist is my very first facial mist. The reason I bought it was to refresh my face. I use this before and after my makeup. Using it before makeup application makes its easier to spread the products especially liquid foundation or bb cream. Using it while on the go makes makeup fresh and reapplication easier. It smells like very very faint lemon, which I really like. It makes the morning smell like morning! (if you get what I mean). I also tried a method wherein I spray mist onto my sponge with liquid foundation. It makes makeup more flawless looking and long lasting. Its confirmed as I tried it now without the mist and the makeup is quite draggy on my skin. 2. Hold it 5 to 10 inches away from your face (consult packaging for specifics). 3. Spritz the product liberally in an X formation. 4. Let the product set for a minute. Blot all excess. 5. Repeat whenever you feel like it—all day, every day, perhaps? 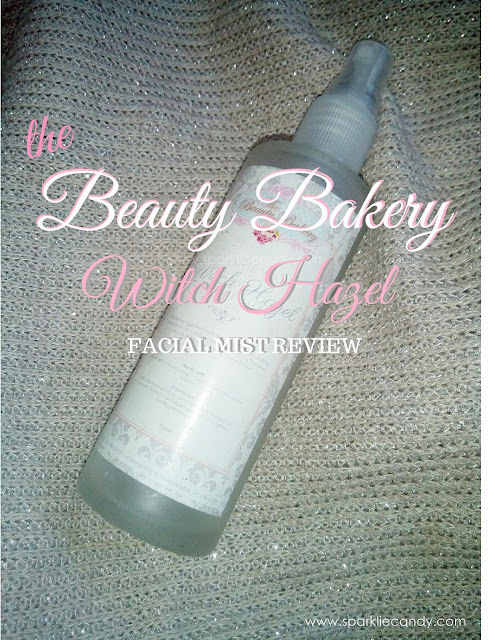 Beauty Bakery Clarifying Witch Hazel Facial Mist is an affordable mist for everyone. With its acne fighting and minimizing pore ingredient, what's not to love?